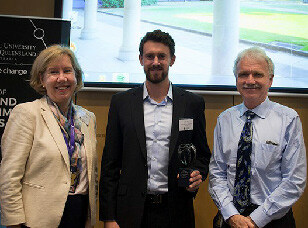 James Allan (centre), recipient of the Elsevier Atlas award, with Prof Melissa Brown (UQ Executive Dean of Science) and Prof Aidan Byrne (UQ Provost). CEED PhD student James Allan was recently awarded the Elsevier Atlas Award, as the lead author on a study examining climate change impacts on World Heritage Sites (Allan et al, 2017). The Atlas is awarded to a single journal article each month, from the thousands of articles published in Elsevier’s journals. James’ article revealed that over 100 world heritage sites are being damaged by human activities. The international team behind the paper also included CEED researchers and associates Sean Maxwell, Kendall Jones, James Watson and Oscar Venter. 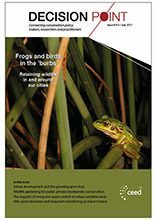 “This paper makes significant advances to conservation science and environmental policy because it is challenging three misconceptions of our progress towards better nature preservation. Those are related to space, time, and success,” says the Editor-in-Chief of Biological Conservation, Vincent Devictor. The research found that some of the world’s most valuable natural areas were suffering from forest loss and damage caused by encroaching human activities. The article outlined which World Heritage Sites have been most impacted by human pressure (roads, forest loss, infrastructure, agriculture and urbanisation).